Nicklaus North Golf Hole 1 (right): The starting golf hole features one of the tightest drives of the day with thick trees left and a hazard to the right, so the golfer is tested right away. The green is fairly open if the tee shot finds the short grass. 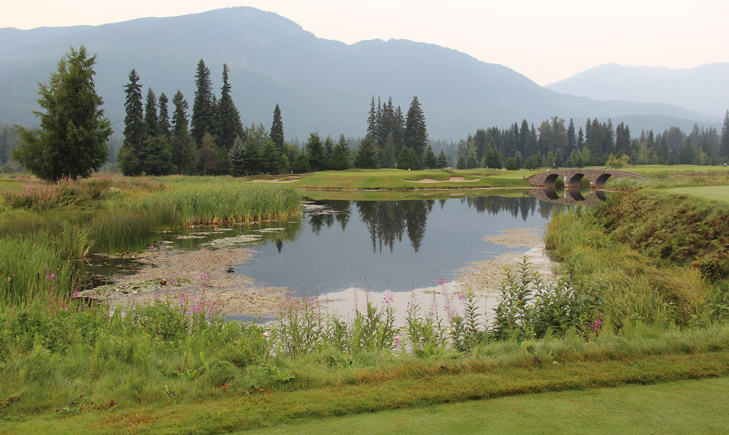 Nicklaus North Golf Hole 2 (below): On a course full of good par threes, this one is the classic effort over water. However, there is tons of room to bail out to the left, and generally any pin placement left of center is much easier than right. Nicklaus North Golf Hole 3: This short par five has a pretty wide-open driving area so the player can attempt to bomb one off the tee. The key is that the green is very wide and the left half of it is guarded by a lake. So, the aggressive player can go for the green in two after a good drive, but there are risks involved and, when the pin is cut left, those risks increase substantially. Nicklaus North Golf Hole 5: This medium length par four has a straight drive and the lake on the left, although blind from the tee, can only be reached by an huge effort. The second shot has a better angle from the right side of the fairway anyway, as the lake cuts away from the green and the real defense are the bunkers, all on the left of the green. Nicklaus North Golf Hole 6: The most mundane of the par threes on the golf course appears to have more trouble in play than there actually is (the lake ends well short of the putting surface). 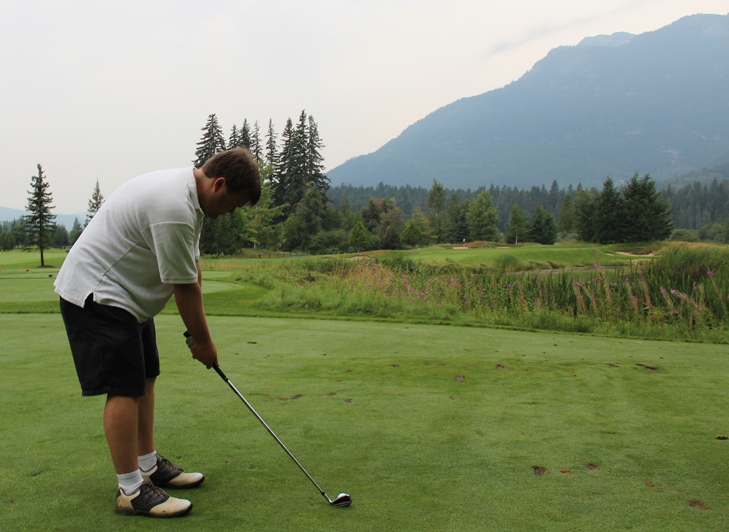 However, the hole still offers great views of the surrounding Whistler area and has a deep green that is set between several bunkers that can cause trouble. Nicklaus North Golf Hole 8: Like many of the holes on the golf course, the par five 8th has obvious trouble (this time, the hazard running the length of the left side of the hole). However, there is plenty of room to miss the other way. This dogleg left also has a series of cross-bunkers about 100 yards from the green that must be avoided. Nicklaus North Golf Hole 10: The start of the back nine is a treacherous par three over water that features a very steep bank short/right of the green. So, anything not finding the surface short, except to the left, will likely find the water. There are also three bunkers to contend with surrounding the green. Nicklaus North Golf Hole 12: Yet another difficult par three, this one requires a solid golf shot over water to a large green. However, there really is no bailout short. There are also four sand traps around the putting surface, all of which will make for a tough up and down to save par. Nicklaus North Golf Hole 13: This par five is fairly straight but feels like a dogleg right because of the large wall of trees down the right side, and how the fairway opens up a lot to the left. The key is finding the fairway and then avoiding the large bunker about 80 yards from the green, and the deep one to the right of the putting surface. Nicklaus North Golf Hole 14 (right): Once again, this golf hole features a wall of trees (on the left). But, the slight dogleg left gives no reason to challenge them as the approach to most pin placements is better from the right side of the fairway. The golfer just needs to avoid the bunker on that side. 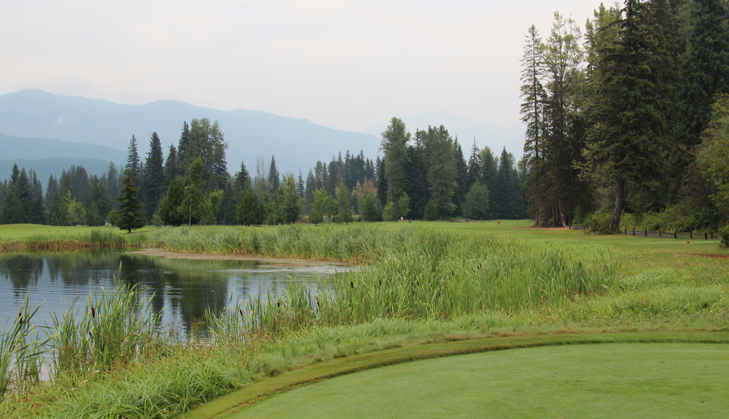 Nicklaus North Golf Hole 16 (below): This medium length par four isn't particularly difficult, but it does feature a shot over the river that drains into Green Lake. The real item to avoid is the enormous bunker to the left of the green. 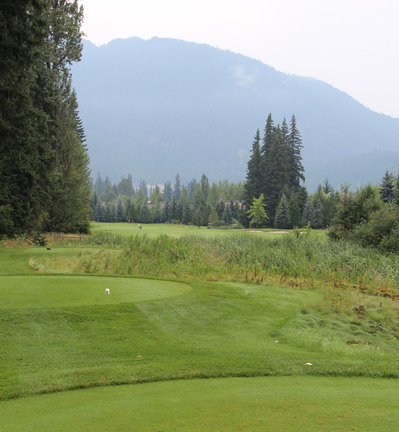 Nicklaus North Golf Hole 17: The final par three is also the signature golf hole. Not only does the green hug the shores of Green Lake, but the hole plays over 200 yards from the two longest tee boxes and is surrounded by a wrap-around bunker from the front to the back. The player can bail out right to avoid a big score, but par here is tough. 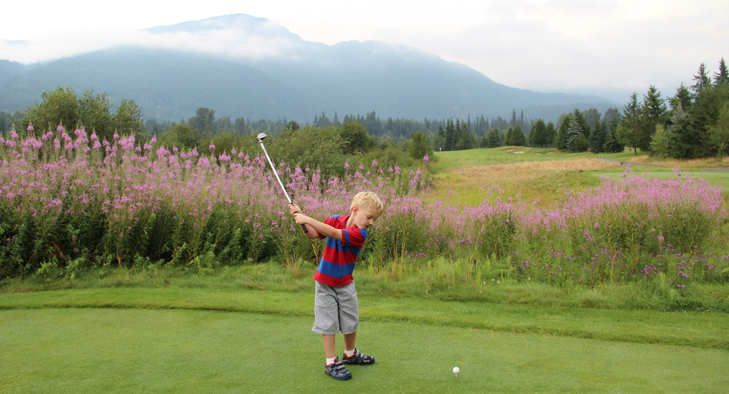 Check out the Chateau Whistler Golf Review.